I’m completely lost in these new offices!! Aha! 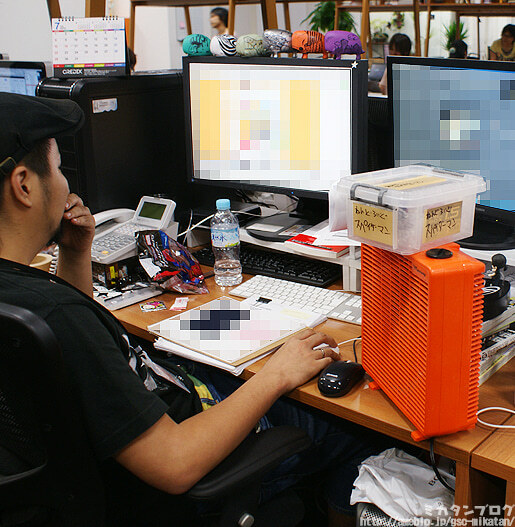 Eno-kun with a new prototype! 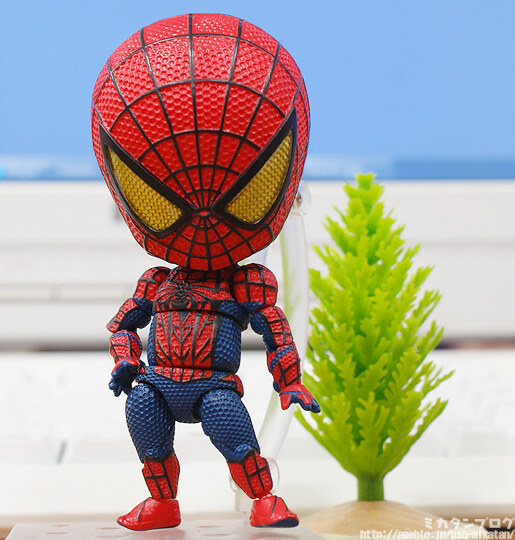 From the world famous ‘Spider-Man’ series comes a fully posable Nendoroid of Spider-Man in his outfit from ‘The Amazing Spider-Man’. All the finest details of his outfit have been added in Nendoroid size! He is made to be fully posable so you can recreate all of your favorite action scenes and poses from the films or comics! As you can see he makes use of an amazing texture! It really looks (and feels?) just like the texture of Spider-Man’s costume! 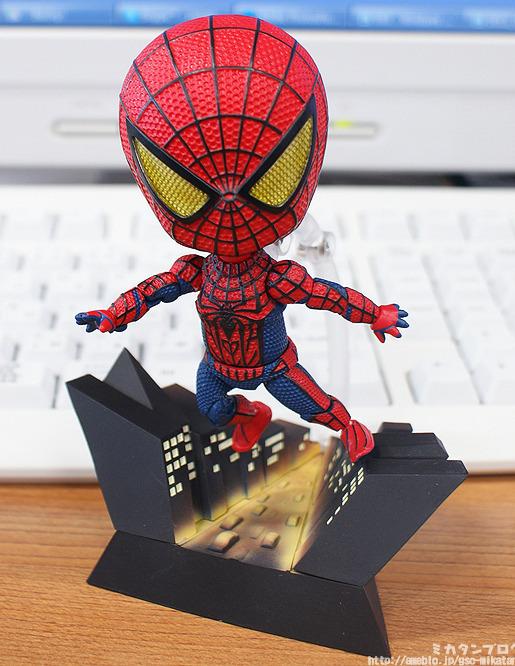 This was done by first sculpting the Nendoroid from a normal material, and then applying the spiderweb design using 3D data afterwards. The cooperation between a normal sculptor and a 3D sculptor shines once again! A diorama pedestal is also included! A completely new kind Nendoroid stand! 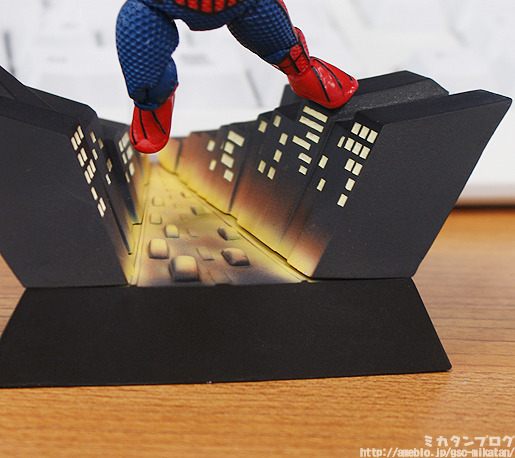 It lets you pose him swinging from his web above the night streets of New York! The arm included with the stand is much longer than normal to allow for midair poses like this one! The diorama is really nice quality as well! The use of the gradient to create the night light effect is really pretty! You could also use this stand with any other Nendoroid that make use of an arm-type stand, which could make for some interesting scenes! You can pose about to shoot out his web! It just wouldn’t be Spider-Man if you couldn’t pose him like this! 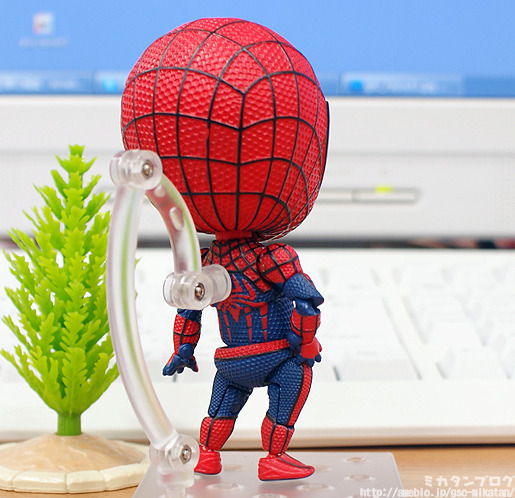 You can also create the pose of him swinging just like this by placing his thighs, knees and ankles at the right angles. Even for me who is normally terrible at making poses, this wasn’t too hard to accomplish! Or even pose him shooting the web! This is done with a quick swap of his hand parts to another set which is shooting out the web! Now it really feels like Spider-Man! Great job, Eno-kun! You can choose to pose him with both hands shooting web like the above picture, or of course just use one for a swinging pose! 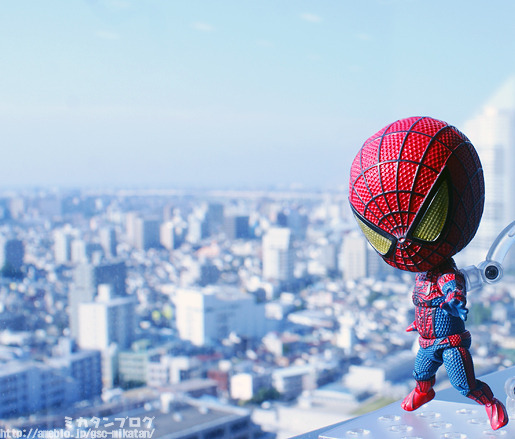 Spider-Man, watching over the city! He’ll be up for preorder from Next Week! TM & © 2012 Marvel Characters, Inc. © 2012 CPII. All rights reserved.